A bank teller is a person who performs a variety of tasks in a bank like feeding the customer’s transaction into the system for records and receipt generation; they receive money for deposits, process withdrawals, and they count currencies. They play a significant role in keeping a track on cash and vault transaction and help in deepening the bond between the customers and the bank. Many assume the role of a bank teller to be a behind the desk job. But it is much more than that. They need to be quick, alert, and aware of the various transactions they witness. 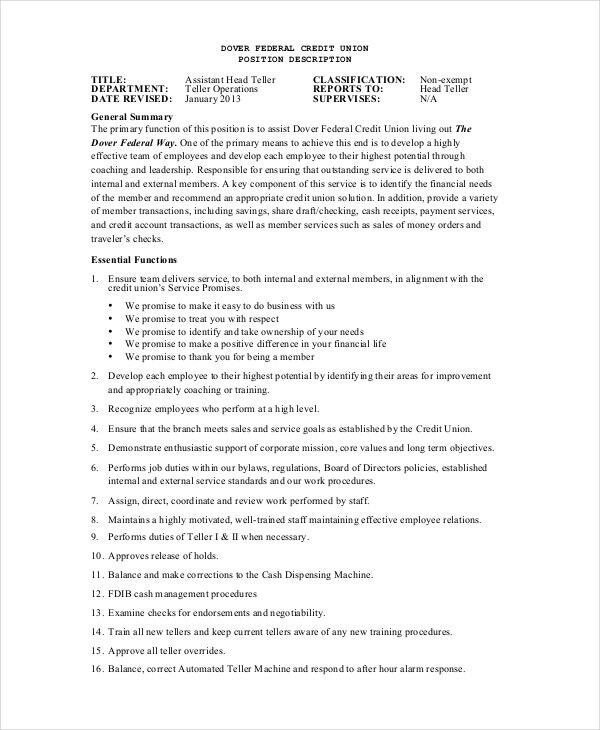 The following is a collection of job description templates that will offer you a better understanding of the different roles and responsibilities of a bank teller job. > Who can use these Teller Job Description Example Templates? 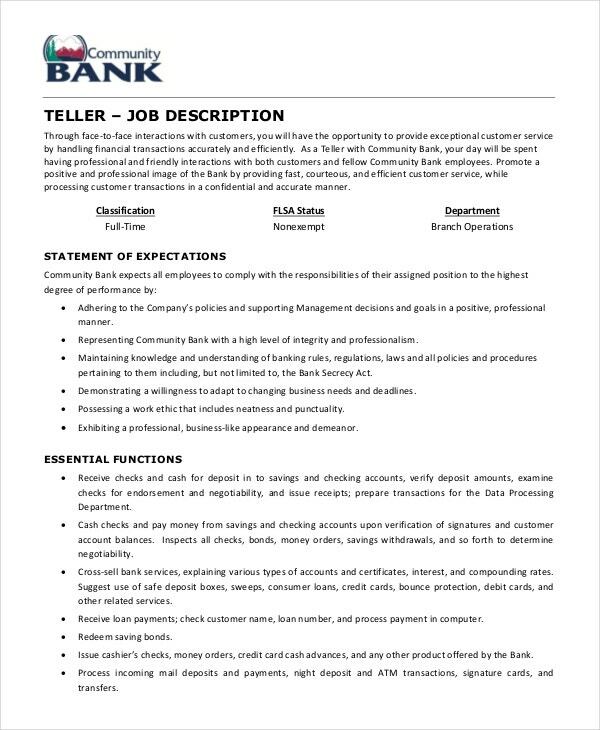 The teller job description templates as mentioned above can come handy for banks who are looking forward to hiring responsible, alert, and efficient bank tellers who can handle a large volume of transactions without any hassle. 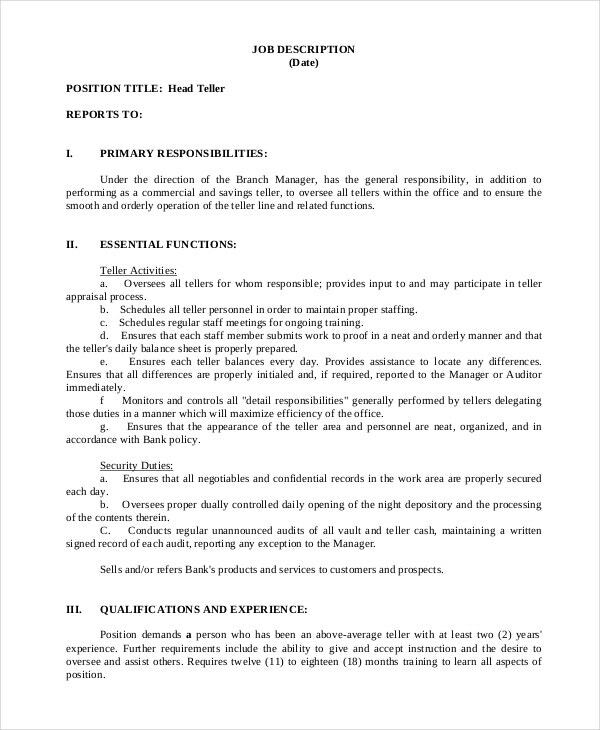 Banks can use these bank teller job description templates to mention the required duties and responsibilities on the part of a bank teller while describing the job role in their job portal. Aspiring bank tellers can also check these templates to get a clear understanding of the various roles that they need to perform and it will help them to analyze their skills and efficiency so that they can decide for themselves if they fit into the role or not. Bank tellers are responsible for providing exceptional customer service that also includes efficient and accurate transaction processing. You should download the Community Teller Job Description Example as it offers a detailed description of the job role of a community teller. The job of the head teller of a bank is to supervise each and every bank teller’s functioning of their required duties and responsibilities. If you are looking forward to applying for the job position of a head teller in a bank, down and use this Head Teller Job Description Example in PDF. A Bank teller looks after both individual and corporate clients. Since the potential of investment of corporate clients is higher, it becomes essential for the merchant tellers to provide extra attention and service to them. 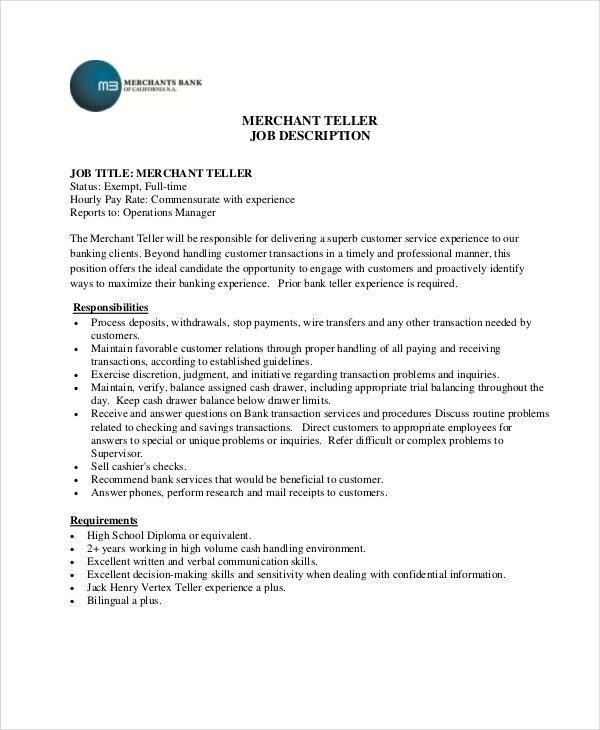 Go through this Merchant Teller Job Description Example for more information. > What are the uses of these Teller Job Description Templates? The above-listed job description templates are not only useful but also very beneficial to both the banks as well as the applicants. 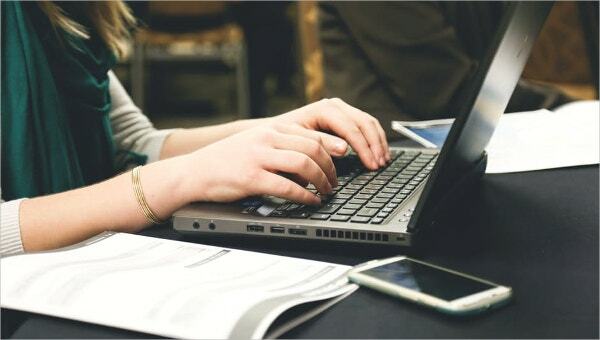 The templates are created in a such a manner that the user will get all the right kind of guidelines which will enable him to a craft suitable job description. These templates also assist the users to keep an account of the desirable features which should be incorporated into the job description. The primary purpose of these templates is to display all the skill sets and knowledge required to enter the arena of a bank teller. You can also see Bank Teller Resumes. 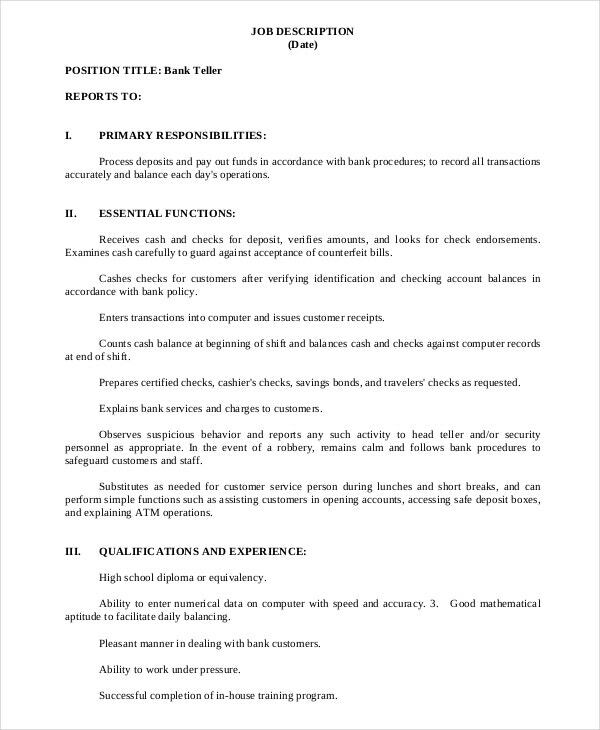 We have an extensive collection of bank teller job description templates that you can go through as it will help you with a better understanding of the various roles and responsibilities required to perform by bank tellers. You should choose the template that matches your requirement perfectly. You can customize the print-ready template or decide to be original by creating your own job description.